To analyze your data on a geospatial reference, you first need to associate a geospatial dimension to your original data points, aka geo-reference. 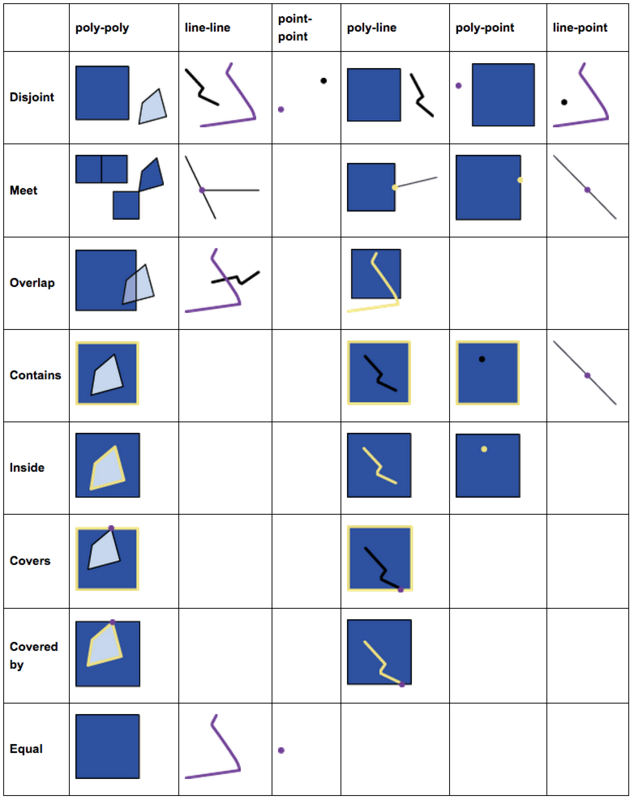 Geoprocessing techniques then bifurcates according to the two major categories on geospatial data: vector and raster. Vector data analysis are mostly computational geometry, while raster data analysis are mostly computational algebra. Geocoding is the process of matching/mapping an address to its latitude and longitude, useful for standardizing location information. Reverse geocoding the inverse mapping of geocoding. Vector data analysis are mostly computational geometry. But geometric calculations such as containment (point-in-polygon), connectivity, adjacency, partition, boundary, and network tracking are computationally intensive. For this reason, Combinatorial structures known as simplicial complex (topological complex) are constructed to convert computational geometry algorithms into combinatorial algorithms. Data structure: static (fixed geometries), dynamic (incrementally changing geometries). Spatial query is a special type of database query (SQL). Attribute queries (select by attribute). Spatial operations generate new geometries from existing ones. Line Simplification: selective removal of vertices on a polyline while preserving shape. Clip: clip one boundary using the outline of another boundary. Union: join boundaries of contiguous area only, without changing attributes of each feature. Merge: join contiguous areas into one while inheriting attributes from one feature. Spatial Join: Joins attributes from one feature to another based on spatial relationship. Dissolve: create coarse regions from finer ones through some summary attribute. Buffer: uniform distance from a feature. † "Within" is sometimes known as "inside"; and "touches" as "meets". Raster data analysis are mostly image processing (computational algebra). Aligning geographic data to a known coordinate system so it can be viewed, queried, and analyzed with other geographic data. DEM data are stored in ASCII grids, which is a raster format.